Canoeing on Whitefish Lake in Algonquin Provincial Park in Ontario, Canada is very peaceful especially during a sunset where nature's wonders reflect in the calm lake water. A woman leisurely paddles along the lake while enjoying the magnificent scenery that surrounds Whitefish Lake. 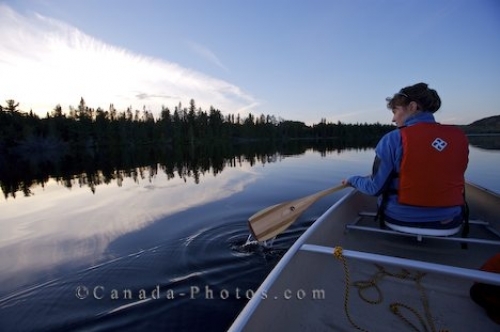 Picture of a woman canoeing at sunset on Whitefish Lake in Algonquin Provincial Park in Ontario, Canada.